With summer time here and more time on my hands, you'd think I wouldn't mind putting in more work in the kitchen. But with the summer heat and 100 other things on my to-do list that I'd rather be spending my time on, turning on the oven and spending a whole lot of time on dinner doesn't always make the cut. So here I am, a good way through the summer: still craving those fresh summer flavors and wanting enough food made to get us through lunches the next day, but not willing to spend more than about 30 minutes on a meal. Sound familiar? 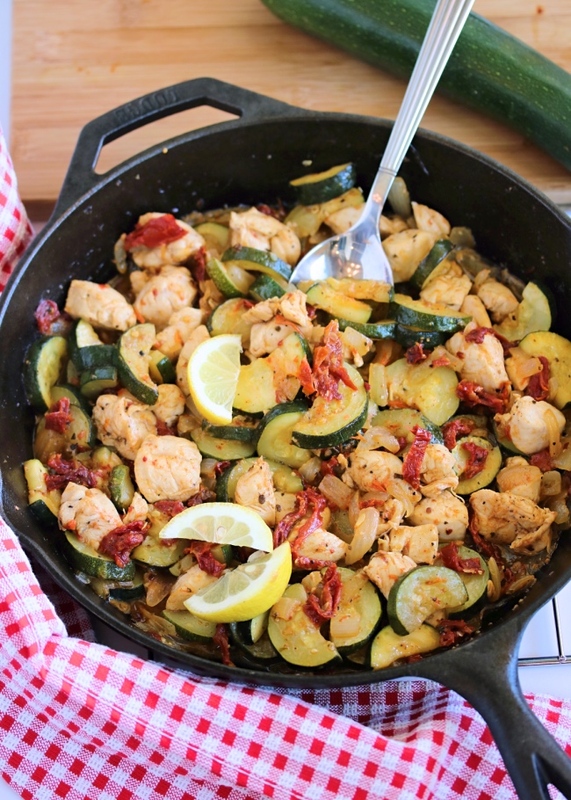 This Tuscan Chicken Skillet dinner is a recipe I threw together on a whim one night, with no intentions of making it again - just all my favorite flavors thrown in a pan and cooked 'til done. Until we both tasted it, and looked at each other with raised eyebrows~ because this flavor combo has some serious yum factor! 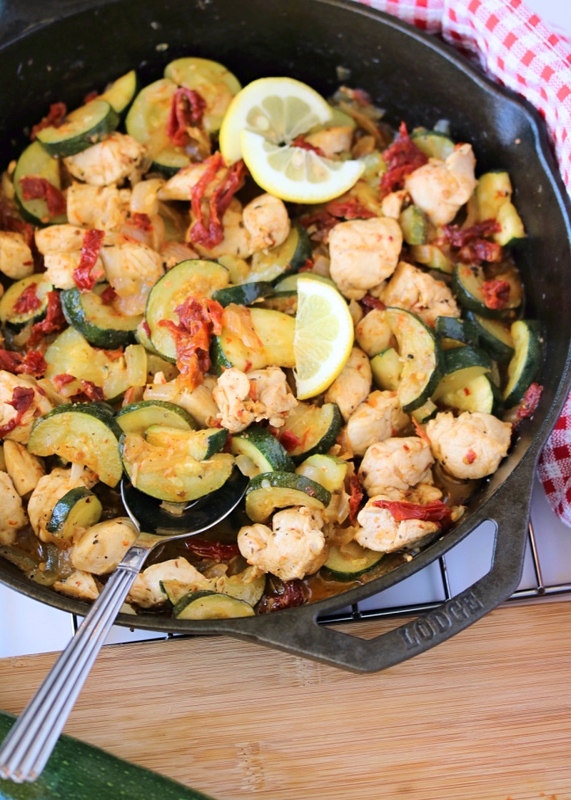 It's still light, with lots of zucchini filling your plate, but hearty enough to fill you up with some juicy chicken breast chunks. The wow factor comes from the flavors in the dish, though: sun dried tomatoes (*swoon*), garlic, Italian herbs, a pinch of red pepper flakes, and fresh lemon to round it all out. While the ingredients list is super simple, don't let it fool you! This dish is far from bland or boring, and super versatile. Serve it over greens for something light, or make it a bit more hearty scooped over smashed gold potatoes or roasted spaghetti squash. I hope you love this meal as much as we do! It's become a new go-to, and is truly easy to make! Heat the olive oil in a large skillet over medium high heat. 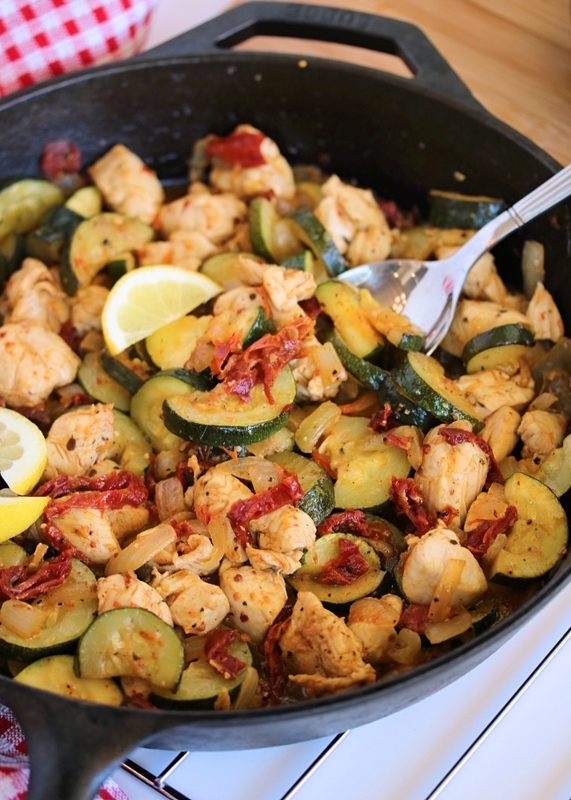 Add the zucchini, onion, and garlic, and sauté for 3 to 4 minutes or until the zucchini begins to lightly brown. 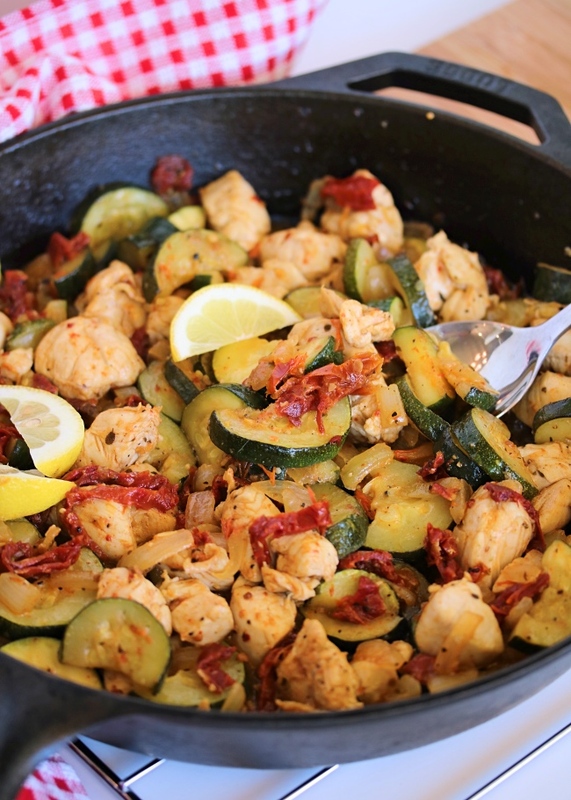 Add the chicken and sun dried tomatoes. Continue to sauté, stirring often, until the chicken pieces are cooked through. Season with spices to taste, and give it a final stir. Serve alone or over spaghetti squash or roasted potatoes, garnished with lemon wedges. I typically purchase breast tenders rather than full breasts. They're often less expensive, and quicker to cut into pieces for recipes like this! I think anyone on any diet may be able to eat this. 3 main ingredients! Looks so yummy, looking forward to make my life simpler! 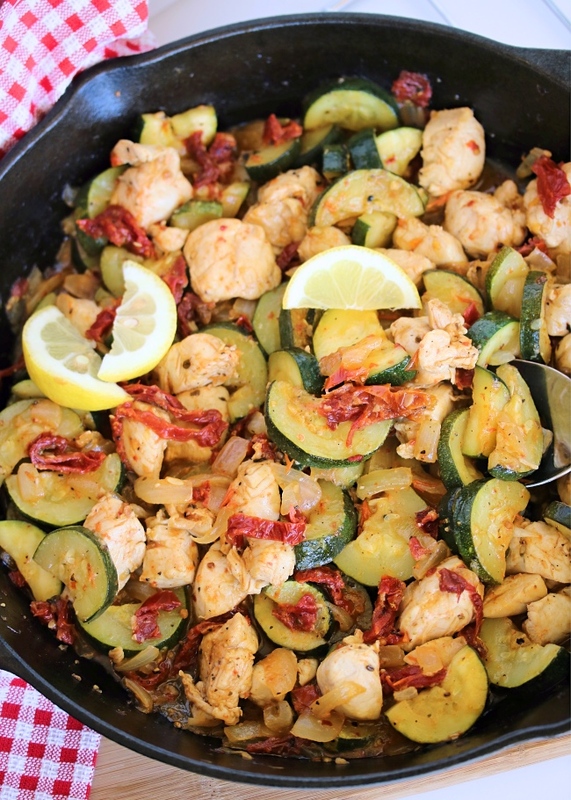 I knew i would like this but was unsure about the rest of my family... My husband it was delicious, my pickiest eater said it was the best meal and had seconds!! 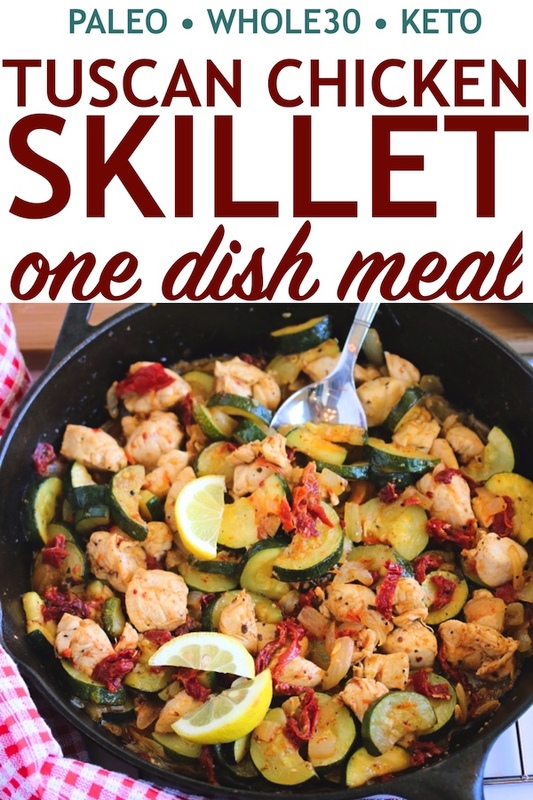 Thank you for your easy one skillet recipes!!!! I used chicken thighs and addressed some fresh basil but other than that followed your recipe to a T!